Alex Smith heads for Finland to investigate Finnaster’s latest interpretation of the 18-foot bow rider. 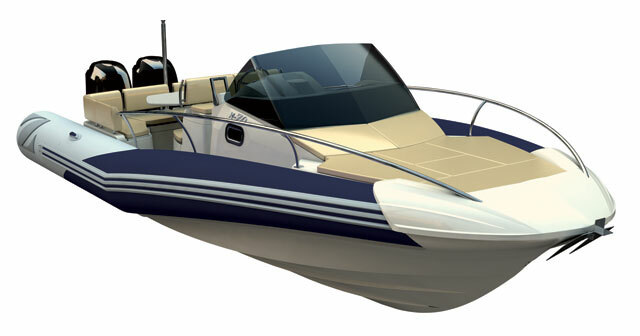 Ever since its foundation in 1990, Finnmaster has been about the design and construction of small leisure boats. 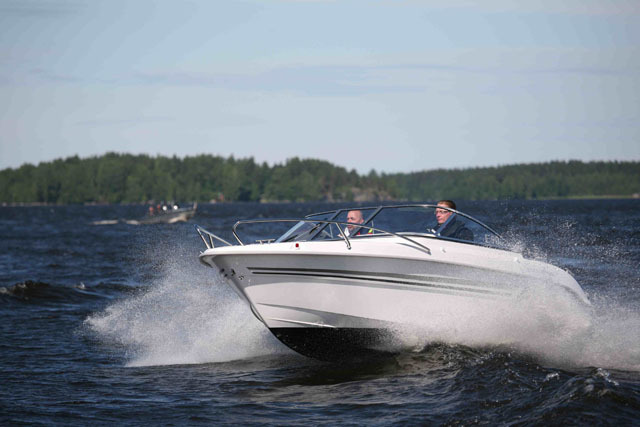 With just 12 craft in its current range, it is not as prolific in terms of model variety as it used to be but it still offers boats from 4.85 to 8.4 metres in length, in four basic lines – Pilot, Cabin, Cruiser and Open. 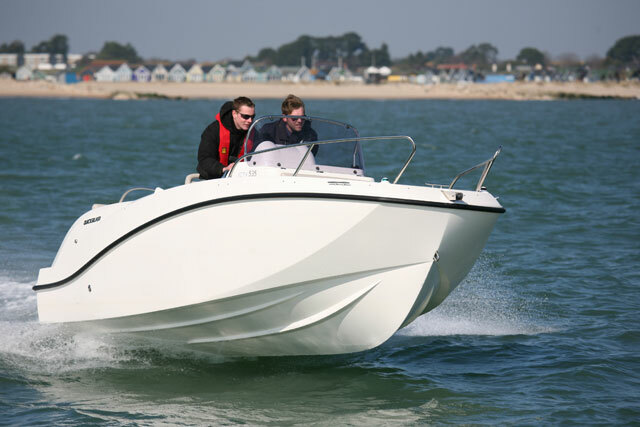 As the third smallest of the six Open craft (and one of only two bow riders in the range), the Finnmaster 55 BR is designed to be easy to drive, versatile, practical and sufficiently entertaining to engage the keen driver – and happily, its relative simplicity also happens to make it more affordable than similarly proportioned craft from Finnmaster’s other product lines. One of the key differences with this new bow rider is that its chief priority is not actually riding in the bow. In fact, riding up front at all looks like a distinctly unsociable prospect here because in place of the usual V-shaped seating unit with table and sunpad infill, you get a peculiarly asymmetrical set-up. 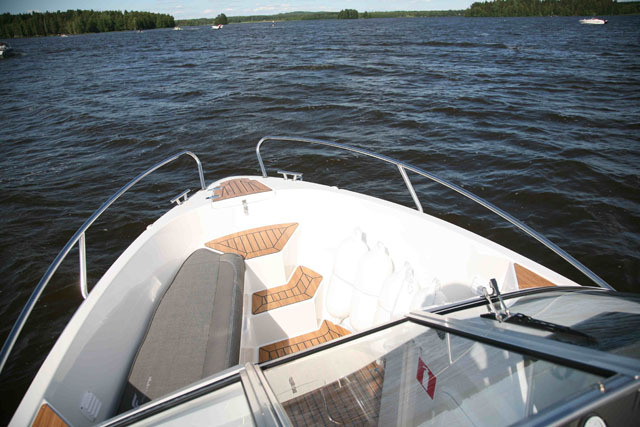 To port is a small bench seat for one (or at a real push, two people); in the apex of the bow is a set of steps, framed between a pair of vigilant Scandinavian grab rails; and to starboard is a large, four-piece fender rack, which comes as part of the standard package. There is also a second embarkation point here on the starboard side, just ahead of the screen, plus a third on the port side behind the small bench seat. In short then, what might have been a three-man bow on a seven-man boat has become a one or two-man bow on a six-man boat. However, this is not necessarily a bad thing. If you want more deck space and bow depth for fishing, or you want a configuration that is tailor-made for nosing into a pontoon or beaching the boat and stepping off the bow, this layout is perfect. The steps are deep, wide and safe, the guardrail is strong and steep and the security on offer is far better than on most bow riders. However, if you want a second dining area or a sunbathing space up front (or you want to be able to sit in the bow facing forward with your feet up while someone else takes care of the wheel) then this workmanlike interpretation of the bow rider concept might leave you feeling just a little bit cheated. The bow is tailor made for putting a man ashore. 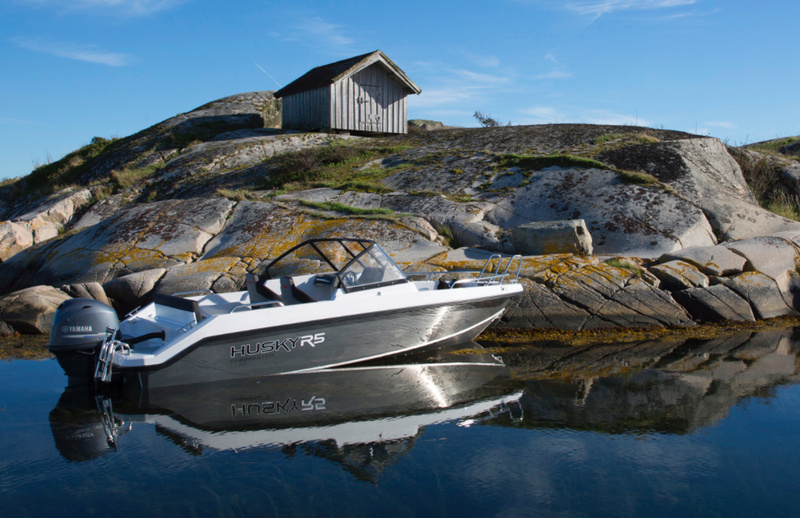 Elsewhere on the Finnmaster 55 BR, the preeminence of cool practicality over infantile gimmick continues unabated. The main aft compartment for instance is beautifully broken down into individual sections, with military-neat hinges and rams, plus drained and lined storage spaces, tidy, workmanlike cable routing and proper dedicated positions with securing clips for the nav pole, table and stanchion. The battery is also stowed inside a dedicated box and strapped firmly into place and the electrical switchboard is equally well arranged and accessible. 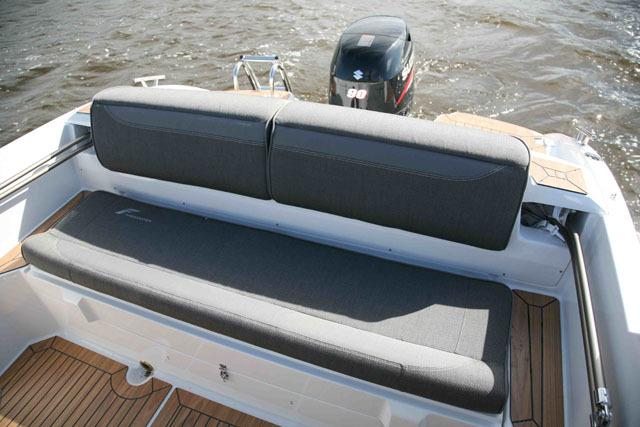 Up at the helm, both the skipper and navigator are treated to an adjustable, bolster-equipped armchair on sliding deck rails, plus a foot brace and stainless steel grabbing points in exactly the right places. Further aft, the twin-stanchion cockpit cover is quick to erect but stows neatly behind the aft bench when the sun pops out – and although the bench is slightly narrowed by this arrangement (and by the provision of yet another boarding step on either side), a generous beam of 2.25 metres means it will still seat three people with ease. The aft bench is framed by embarkation points. The 55 BR is also very user-friendly underway. As a slightly lighter, beamier boat with a deeper V than various other craft in the Open Line, it offers a useful blend of efficiency and composure. The remarkable depth of that peculiarly deck-intensive bow makes things feel much more grown up and secure from the helm - and the fact that the hull is so responsive to trim means you can elevate and drop the nose with great speed and alacrity. 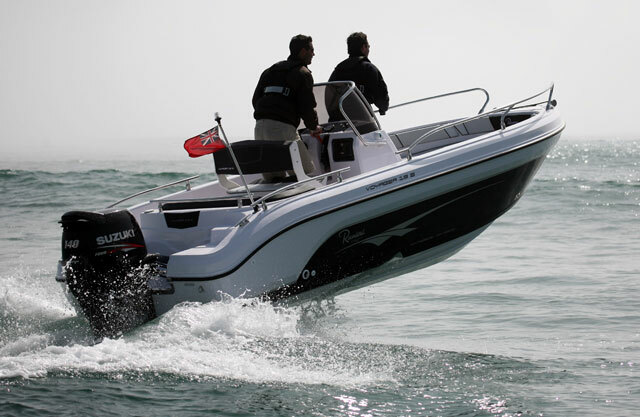 Though minimal, the modern, matt grey, anti-glare dash is every bit as slick and effective as the helm position and in partnership with Suzuki’s DF90, that makes this not just a comfortable 35-knot boat but also a very effective and enjoyable driving machine. 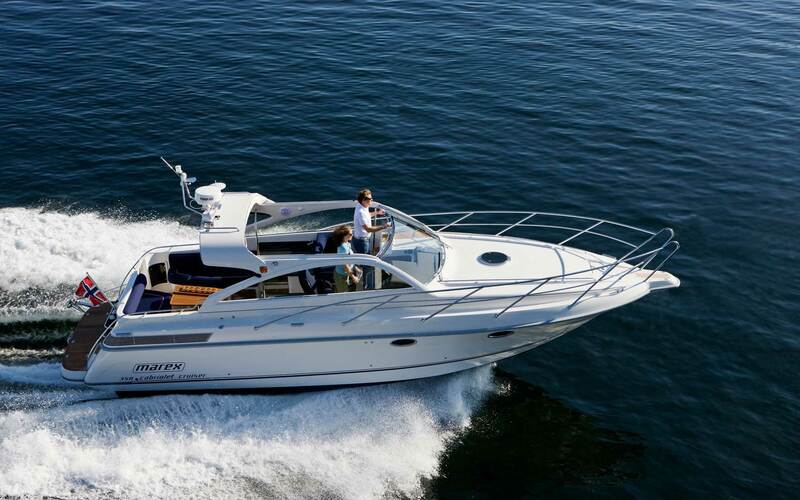 However, if you can afford the extra thousand or two, Finnmaster’s excellent 59 SC from the same Open line might also be worth a look – not just for its slightly more conventional use of the bow space, but also for its inclusion of the ski pole, hydraulic steering and upgraded 139-litre fuel tank as part of the standard package. 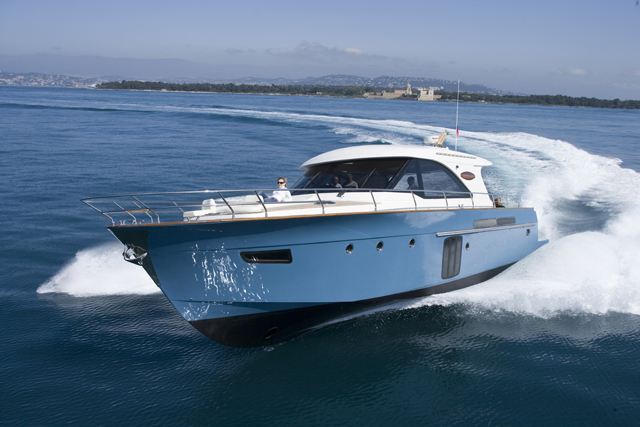 With a refreshing, mind-cleansing serenity to its driving dynamics, its user friendly ownership experience and its surgically precise mouldings, there is no doubt that the 55 BR stands out as a boat of remarkably comprehensive intelligence and tidiness. The key question for you is whether that’s what you want. Do you really need seven dedicated embarkation points with teak-effect trim and graduated steps? Do you really need a four-fender rack where you might otherwise see some extra seating and storage? And do you really need three anchor lockers when half the world’s boaters fail to use the one they actually have? 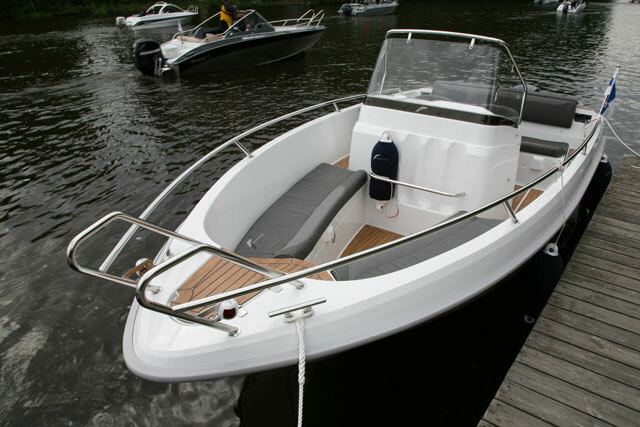 The answer for many of us is probably no – and yet if the boat still manages to seat the maximum complement of six people, perform as its heritage suggests it should, and come in at a price you can afford, then why on earth wouldn’t you err on the side of Scandinavian overkill?